Nearly 24 years after the 1991 Gulf War, a Baylor University scientist has identified a significant link between Gulf War Illness (GWI) and a genetic factor that can render some individuals more susceptible to adverse effects of certain chemicals. The final study, published in the BMC journal Environmental Health, found that veterans with identified variants of the butyrylcholinesterase (BChE) gene were 40 times more likely to have GWI if they took an anti-nerve gas pill called pyridostigmine bromide (PB) during the war, compared to veterans with similar genes who did not take the pill. The study provides the first direct evidence of a specific gene-exposure interaction in veterans' risk for GWI, the complex medical condition that afflicts at least one in four of the nearly 700,000 U.S. veterans who served in the 1991 Gulf War. 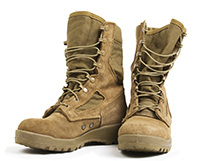 Epidemiologist Dr. Lea Steele, research professor in Baylor’s Institute of Biomedical Studies and the study’s lead author, said the study can help explain why some veterans developed GWI in connection with their service in the 1991 conflict, while others who served alongside them remained healthy. "It has long been known that genetic differences can produce differences in how individuals metabolize certain chemicals," Steele said. "These results are important because they identify a specific genetic factor that would plausibly put veterans at increased risk for GWI in connection with a chemical to which personnel were widely exposed during the 1991 Gulf War." Previous studies have determined that GWI is not the result of combat stress and that evidence most consistently implicates chemical exposures during deployment. The 1991 Gulf War was the only conflict in which hundreds of thousands of U.S. troops took PB as a protective measure against the possible deadly effects of chemical nerve agents. Chemical weapons were thought to pose a risk to U.S. military personnel during the brief 1991 war because of their recent use in the region by Saddam Hussein's Iraqi forces. The most prominent GWI risk factors identified by studies of Gulf War veterans include taking PB and exposure to certain pesticides that can exert toxic effects on the brain and nervous system. The body's natural defenses against these compounds include BChE and other enzymes that can neutralize the toxicants and protect against adverse effects. The Baylor study compared BChE in 144 veterans with GWI and 160 healthy veterans, and probed specifically to find out if the association of GWI with PB differed with BChE genetic type. For the majority of veterans, who had the most common forms of BChE, use of PB was associated with a nearly three-fold increased risk for GWI. The risk was dramatically higher, however, for the 9 percent of veterans with genetic forms of BChE that provide reduced enzyme protection. Veterans with these less active forms of BChE were 40 times more likely to have GWI if they used PB during the Gulf War, compared to those who did not use PB. Steele cautioned that these findings can only be considered preliminary, since the study is the first to report this genetic association and included a relatively small number of veterans. She emphasized that the specific genetic link identified by the study would apply only to the subgroup of veterans with "at risk" BChE genotypes and would not explain other cases of GWI. "It is important to evaluate this in a larger group of Gulf War veterans to determine if it can be replicated and provide more information about how many veterans were affected," Steele said. Steele is the director of the Veterans Health Research Program at the Baylor Institute of Biomedical Studies.